ALDATE, a Briton who lived in the western counties of England, and in some legends is styled Bishop of Gloucester. Famed for his resistance to heathen invaders, he encouraged his fellow-countrymen to resist as well. This, coupled with his pious and exemplary life, gained him local repute as a saint. There are quite a few West Country churches which bear his name as their titular saint; St. Aldate’s in central Oxford also bears his name. It is very possible there were two Saints of this name in fifth or sixth century England, though reliable details of their lives are lacking; hence, it is all but impossible to disentangle their legends. Notwithstanding this confusion, we may safely place his repose in the middle of the fifth century. 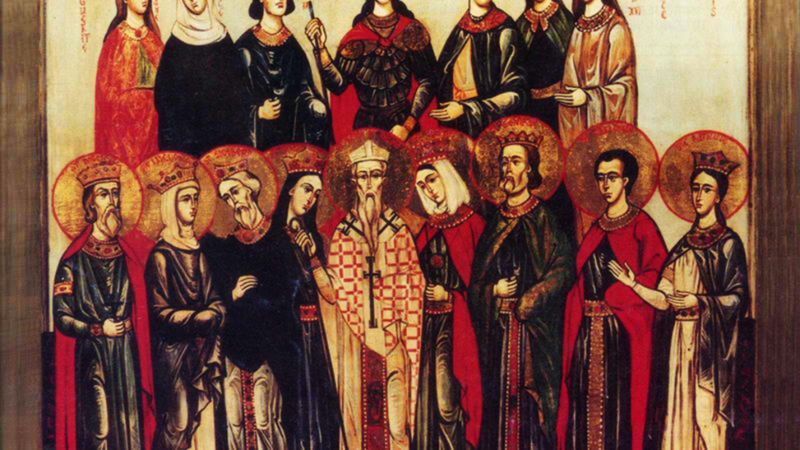 AQUILINUS, GEMINUS, GELASIUS, MAGNUS, and DONATUS, third century martyrs at Fossombrone in central present-day Italy. No further information on them is extant. AVENTINUS of CHARTRES, the fifteenth Bishop of Chartres. St. Aventinus succeeded his brother, St. Solemnis (25th September) as bishop of that See circa 511, serving until his repose circa 520. AVENTINUS of TROYES, almoner to SS. Lupus (29th July) and Camelian (28th July), Bishops of Troyes. St. Aventinus resigned his position to live as an anchorite in the Pyrenees, at a place now called Saint-Aventin in his honour. St. Aventinus reposed circa 538. EUTYCHIUS, (Fourth Century), martyred in Rome during the Diocletianic Persecution. It is said that following torture, St. Eutychius was imprisoned for twelve days without food, and then thrown into a well to drown. LIEPHARD, a native of England, and possible bishop, according to some legends he was a companion of King Cædwalla (r. 685–688) in the latter’s pilgrimage to Rome. St. Liephard was martyred near Cambrai in France circa 640 while on his way back to England. There are those who have confused him with St. Liudhard (24th February), the bishop who attended Queen Bertha to Canterbury; however, neither dates nor ascertained facts support this theory. MODAN, St. Modan was an Irish monk who went to Scotland where he built a chapel at Dryburgh, which grew into the famous Dryburgh Abbey. From this base, he actively preached the Gospel in the Falkirk and Stirling areas, as well as along the Forth. His strict asceticism and great humility lead the community to elect him Abbot of Dryburgh, a position he accepted with great reluctance. After a number of years, he resigned and became a hermit in the Dumbarton area, where he lived until his repose. His relics were enshrined at St. Modan’s church, Rosneath. In addition, he is the titular saint of the great church at Stirling, and honoured particularly at Dunbarton and Falkirk. NITHARD, a monk at New Corvey in Saxony, and fellow-worker of St. Ansgar (3rd February) in the evangelisation of Sweden. St. Nithard was martyred by pagan Swedes in 845. REMBERT, a monk who worked with St. Ansgar (3rd February) in the evangelisation of Denmark. St. Rembert succeeded St. Ansgar as Archbishop of Hamburg-Bremen in 865. He was the author of the comprehensive Vita Ansgari. St. Rembert reposed in 888. VINCENT of TROYES, the ninth(?) Bishop of Troyes from circa 536 until his repose circa 546. VULGIS, Abbot-Bishop of the Abbey of St. Peter of Lobbes in Hainaut (present-day Belgium), he reposed circa 760.